A financial advisor provides financial guidance on everything from monthly budgeting to investing in the stock market. Many financial advisors find it rewarding to help others take control of their finances. But that certainly doesn’t mean they work for free. The average salary for a financial advisor was $90,460 in 2017 well above the national average. Job prospects in the field are also good with employment expected to grow by almost 30% from 2014 to 2024. Find a financial advisor to help you meet your retirement savings goals. A financial advisor provides financial advice to clients. Not all advisors have the same areas of expertise but they all share the same goal of helping people to understand their finances and makes the best financial decisions. The term financial advisor doesn’t apply to just one profession. It’s more of a blanket term that includes financial planners, insurance agents, stock brokers, tax professionals and even some bankers. The exact advice and services that a financial advisor offers can also vary. Services could span from budgeting and retirement planning to managing a client’s investment portfolio. Most advisors choose to specialize in one area such as taxes, retirement or estate planning. So if you’re looking for a financial help, make sure to find a financial advisor that matches your needs and goals. According to the Bureau of Labor Statistics, the average salary for a financial advisor in 2017 was $90,460. That is well above the average national salary of $37,040. There is a big difference though between the highest- and lowest-earning financial advisors. As you can see from the table below, annual salaries can range anywhere from about $41,000 to more than $200,000. A financial advisor’s earning potential will also depend on where they live. If you compare by state, the average annual salary ranges from $50,970 in West Virginia to $132,240 in New York. National Financial Advisor Salaries Percentile 10th 25th 50th (Median) 75th 90th Hourly Wage $19.79 $27.63 $43.53 $77.16 $100.00 Annual Wage $41,160 $57,460 $90,530 $160,490 $208,000 How Do Financial Advisors Make Money? When it comes to pay, there are a few different ways that a financial advisor can earn money. Some financial advisors work on a commission. These advisors will make a set amount every time they sell a certain product or service. This could include selling a certain insurance product or getting clients to buy a particular mutual fund. It is possible for conflicts of interest to arise with an advisor who works on commission. It is less common for a financial advisor to earn their pay strictly off commission if they are certified with some of the common financial advisor certifications. The certifications and licenses are independent of pay structure, but some require advisors to act in the best interests of their clients. These financial advisors will usually earn their money through fees or a salary instead. Fee-based advisers charge an upfront fee to their clients. They could also earn a commission. Fee-only advisors earn their pay strictly from the fees they charge to their clients. They may charge a flat rate fee for their services or they may charge clients at an hourly rate. A fee-only advisor may also calculate fees based on a percentage of assets that they manage for a client. As an example, let’s say a financial advisor charges a 2% fee on assets under management. If the advisor handles $10,000 of your assets, then you will have to pay a fee of $200 (2% of $10,000). As you can see, the fee doesn’t amount to much. That’s why fee-only financial advisors typically work with wealthy clients who need someone to manage a large portfolio. Some financial advisors earn a salary. This is most common with an advisor who works for a bank or similar financial institution. Salaried advisors may also earn a bonus or commission for selling certain products. The salary for a financial advisor is relatively high and employment for financial advisors is growing rapidly. The Bureau of Labor Statistics has predicted that employment for financial advisors will increase by 29.4% between 2014 and 2024. If you’re interested in becoming a financial advisor, note that some states offer more opportunities than others. Nine states (as well as Washington, D.C.) had 500 or fewer financial advisors in 2016. Meanwhile California and New York each had more than 24,000 financial advisors. The table below shows the 10 states with the most financial advisors according to the Bureau of Labor Statistics. *Does not include self-employed individuals. At the most basic level, a financial advisor needs to have financial expertise. Most have at least a bachelor’s degree but the exact degree could be in finance, business or economics. Some universities offer a specific degree for something like financial planning. 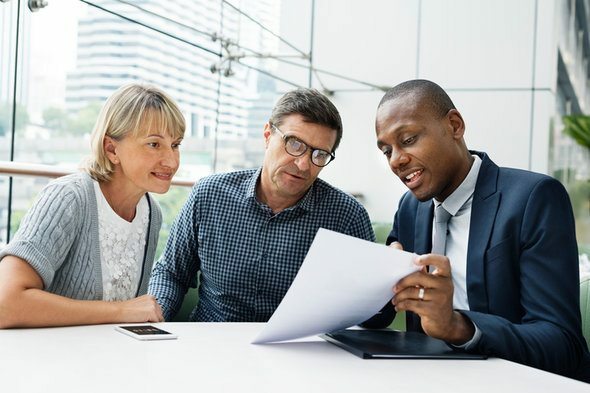 Because a financial advisor needs to work closely with and understand clients, individuals from non-finance backgrounds, like psychology, might also find success. Having a sales background can help because many advisors work off commission. Financial advisors will also need to earn certain certifications or licenses depending on the fields they want to work in. Each certification program will have its own requirements. These requirement could include a specific degree, coursework, a certain amount of experience or passing exams. To get a better idea of what certification is like for a financial advisor, consider a few common examples. In order to become a certified financial planner (CFP), you need to meet certain educational requirements, you need have a few years of experience and then you need to pass the CFP exam. Getting certified as a chartered financial analyst (CFA), which is one of the most-respected certifications you can have, is even more challenging. You need to have a bachelor’s degree and four years of experience. Then you need to pass three six-hour exams in order to receive certification. If you want to specialize in taxes, becoming a certified public accountant (CPA) will help. That certification requires certain coursework, two years of experience and passing an exam. Any advisors who provide investment advice are required to earn a Series 65 license and uphold then uphold certain standards. Financial advisors are experts who help people to make wise financial decisions. The term financial advisor actually covers a number of different professions and each profession specializes in a slightly different area. Anyone who wants a build a career as a financial advisor will need a bachelor’s degree plus a certification that relates specifically to what they want to do. It can take years of hard work to earn certification but it could all be worth it considering the average salary for a financial advisor was $90,460 in 2017. Many financial advisors say it isn’t just about the money, though. They find their jobs fulfilling because every day they get to help people take control of their financial lives. There are a number of factors to consider when choosing a financial advisor. Think about your financial situation. How much do you have saved and how do you have it saved. What are your financial goals? Do you need help creating a college fund for your children? Remember that financial advisors usually specialize in one area. One advisor might focus on planning for retirement while another focuses on income taxes. So be sure to find a financial advisor with the expertise you need. A matching tool like SmartAsset’s SmartAdvisor can help you find a person to work with to meet your needs. First you answer a series of questions about your situation and your goals. Then the program narrows down thousands of advisors to three fiduciaries who meet your needs. You can then read their profiles to learn more about them, interview them on the phone or in person and choose who to work with in the future. This allows you to find a good fit while doing much of the hard work for you. As you look for an advisor, look some someone who has earned the proper certifications like one of these top 10 financial certifications. So if you are looking for particular help with your taxes, you might want to find a certified public accountant (CPA). You should be especially careful when looking for investment advice. Investing in the stock market involves risk and not all advisors are properly trained to provide sound advice. If you want a fee-only financial advisor but you don’t have millions of dollars to manage, you could consider a robo-advisor. Robo-advisors typically charge much lower management fees than a human advisor. The trade-off is that most robo-advisors do not provide access to human advisors. They help you create a plan for your investments and then they manage your portfolio digitally without the need for further input from you. The post How Much Do Financial Advisors Make? appeared first on SmartAsset Blog.